Some NYC Indian restaurants exhibit a weird personality disorder - They sport a fancy decor but when it comes to food they rain misery on customers as if Bad Appetit were their credo. 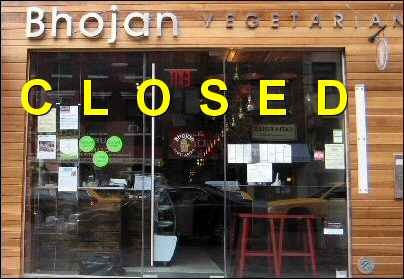 Mon dieu, after tasting an array of dishes and sweets from Bhojan Kosher vegetarian Indian restaurant on Lexington Avenue, we marveled at the chutzpah of this NYC restaurant for serving spoiled and stale food to diners and then daring to charge them. Sure, bad Indian restaurants in the U.S. are choc-a-bloc but restaurants serving spoiled stuff to customers are still mercifully an exception than the norm. Serving spoiled, stale food displays a contemptuous disdain toward paying diners. A sad reflection of the festering rot within the warped soul of the restaurant. In a disgusting, wanton act of cruelty, the Green chutney that came as an accompaniment with our order of Samosa and Mirchi Bajji was spoiled. It smelled bad and tasted awful. How restaurants can be so callous as to serve spoiled fare to diners knowing well the harmful health consequences we'll never understand. If a restaurant cannot serve fresh, unspoiled Green Chutney after charging $5.00 each for a plate of two Samosas or a pair of Mirchi Bajji the obvious question paying customers should, and likely would, ask is "Why does this dump even exist." If an NYC Indian restaurant like Bhojan can't get the humble Green Chutney right, what chance is there of it getting the other stuff right. 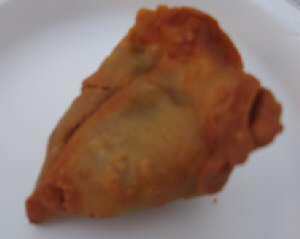 As if the spoiled Green Chutney were not bad enough, the light brown-colored potato filling inside the Samosa had a stale taste and we wouldn't be in the least surprised to learn of its origins in the days when fierce sabre-toothed tigers and gigantic dinosaurs stalked our planet. Mirchi Bajji, our second appetizer, yielded no pleasure owing to its sweetish flavor. 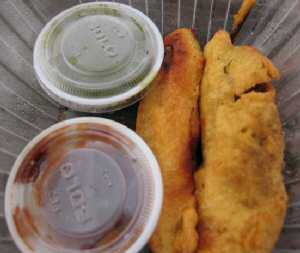 Horror of horrors, the bozos had used sweet peppers to make the Mirchi Bajji. It was a tragedy like few others. Any hope that we'd find our Nirvana in the entrees quickly vanished at the sight of the BPesque oil spill in the curries. 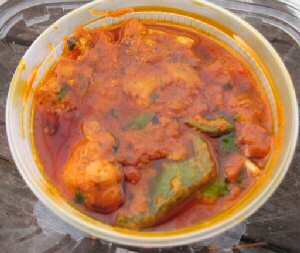 Bhojan's Simla Alu Gobi resembled an oil slick with a thick layer of red color oil floating on top. It was neither tasty nor spicy. Both the Capsicum and Gobi pieces had a raw incompletely cooked taste as if they were added as an after thought to a pre-cooked curry paste. Compounding our misery, the Chapathis were too thick. We did not get much relief even from the Paratha. With trepidation in our heart, we then dipped into the Malai Kofta. Alas, we struck yet another pothole in what seemed like an endless series of missteps from Bhojan. Desperate hope now turned into dreadful despair. 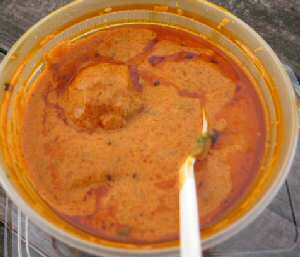 Malai Kofta is usually vegetable kofta balls set in a creamy delicious sauce. While we did not see any evidence of creamy sauce, Bhojan's Malai Kofta like the Simla Alu Gobi turned out to be a flavorless oily reddish mess. There were problems galore with Bhojan's Malai Kofta. First, $12.00 is a ripoff price for Malai Kofta considering the small serving size. Second, the Malai Kofta had just two Kofta balls and the rest comprised of the oily ugly red color mess with the odor of Chicken Tikka Masala gravy. Third, Bhojan's Kofta balls in the Malai Kofta were just Paneer balls. You see, Malai Kofta balls are usually prepared with a mèlange of vegetables and cheese - mashed potato, carrot, green peas mixed with paneer. But Bhojan's Malai Kofta Balls did not have any vegetables. Finally, Bhojan's Malai Kofta ball was very rubbery and chewy suggesting that the Paneer was not of good quality or very old stock. With nemesis dogging our heels, we turned our attention toward desserts. Given our penchant for all things sweet, we fell upon Bhojan's sweets only to recoil in horror after the first bite into Anjeer (an old favorite). Anjeer was sour and had a stale taste and flavor. We have had Anjeer at several places in the NY/NJ area including at Sukhadia (Edison), Swaminarayan Mandir (Cherry Hill) and Maharaja Sweets (Jackson Heights). But never Anjeer as bad as the one peddled by Bhojan made contact with our sweet tooth. Rajasthan Mawa was slighly low on sugar and tasted like a wet flour ball. Ditto with Gulab Jamun. While the outer layer was a little soggy the inner portion of the Gulab Jamun had a raw flour taste. Jamun with Coconut had rose colored dry nuts stuffing inside and was the only acceptable tasting sweet we got. Mango Burfi with dry nuts was not sweet enough for our demanding palates. 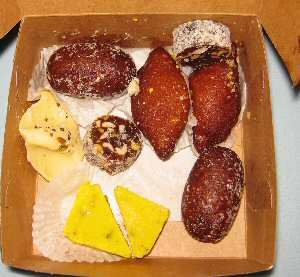 Folks, if like us you have an abiding love affair with Indian sweets then you must pay a visit to Maharaja Sweets in Jackson Heights, NY or Mithaas in Brooklyn for a glimpse of heaven. The sweets are $9 per pound for a single variety but go upto $12 if you want an assorted set. With its stale, spoiled and crappy offerings, Bhojan NYC on Lexington Avenue belies the promise of a nice Indian meal.